Thank you for believing in our children, Scott Enterprises! 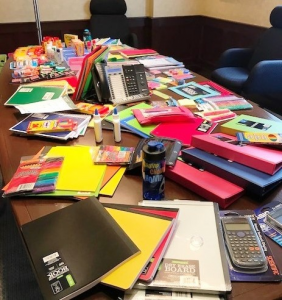 School supplies were collected by Scott Enterprise Employees for our school-age children at Early Connections. 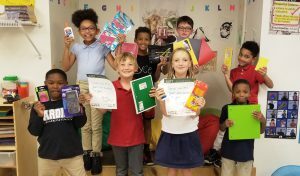 Along with all of the supplies was a letter, each from Nick Jr. and Chris Scott, which helped provide our children with a “can-do” attitude for the school year. Pictured in front row: Darlene Kovacs, Executive Director, Early Connections. 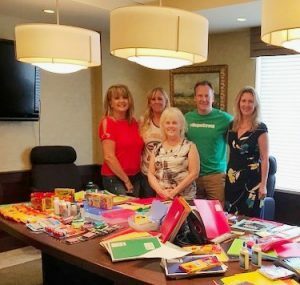 Second row, left to right: Christine Simon, Director of Human Resources, Scott Enterprises; Sharon Johannesmeyer, Safety Manager, Scott Enterprises; Nick Scott Jr, Vice President, Scott Enterprises; Michelle Harkins, Associate Executive Director, Early Connections.